I do not ski. In fact I can count the times I’ve seen snow in person on one hand; mostly because the amount of times is zero! But, seriously, if someone gave me these Audi carbon fiber skis I’d make the trip up to Big Bear every weekend until I was good enough to be a winter X Games contender! I’m not sure why Audi decided to take part in the development of these skis but who cares?! They’re awesome! The only downside is that these bad boys wont be available until the end of the year. Hey Audi, do you think we could get a carbon fiber snow board next? Know-how drawn from skiing and motorsport has been used to develop the perfect ski. The Audi Carbon Ski concept is an eye-catching piece of sports equipment with a minimalist design that focuses fully on one premium material: carbon. The concept study was designed and developed at Audi Concept Design Munich – but like a racing car, it can only be mastered by a top professional. For this reason, the team surrounding chief designer Wolfgang Egger began working on the development of a serial-production ski with the ski specialists from Head. The Audi Carbon Ski may become available already in winter 2011/2012. 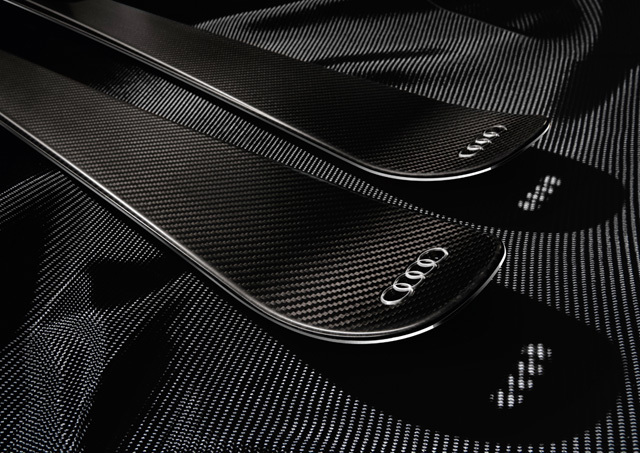 The technology transfer from the concept study to the serial-production Audi Carbon Ski was crucial throughout all of the developmental phases. A cab of high-strength carbon fiber encloses layers of aluminum and titanium, as well as a wood core. At 1,550 grams (with a ski length of 170 cm), the ski will be about 200 grams lighter than comparable models. This allows it to be incredibly maneuverable and agile. In January 2011, as part of the most famous downhill race in the world – the Hahnenkamm race in Kitzbühel – and in February 2011 at the World Ski Championships in Garmisch-Partenkirchen, customers were able to test the first prototypes of the Audi Carbon Ski. In addition to extensive tests by specialists from Head and the German Ski Association, these results will contribute to the ability to offer a perfected ski. During development of the Audi Carbon Ski concept (2008/2009), Audi profited from over 20 years of partnership with the German Ski Association and its own considerable experience in motorsport. Parameters that have proven reliable over many decades of ski sports were analyzed with the use of complex calculation methods drawn from motorsport. The result: construction specifications for a full-carbon ski that guarantees perfect handling properties. After extensive tests, scientific experts from the German Ski Association confirmed the high quality of the Audi Carbon Ski concept. “Thanks to its ideal combination of strength and light weight, carbon is used in motorsport for especially sensitive components that need to withstand the highest stress loads yet must at the same time be light in weight,” says Dr. Wolfgang Ullrich, Head of Audi Motorsport. In the racing cars for the German Touring Car Masters (DTM) and the Le Mans sports cars, for example the new R18, the driver’s cockpit – the so-called monocoque – is made from high-strength carbon fiber. “When creating this possibly lifesaving carbon component, we use the same calculation methods as those that were used for the concept development of the Audi Carbon Ski concept,” Ullrich said. The calculations for the ski define precisely how many layers of carbon must be used – in doing so, the carbon fibers are placed at a specific angle to each other. This allows the engineers to achieve optimal stiffness with minimal torsion. The layers are hardened under pressure in an artificial vacuum. The influence on the handling properties of the ski is revolutionary: the ski flexes on the mogul slopes to achieve optimal grip on uneven surfaces. On icy patches, on the other hand, the ski must not twist, so that the steel edges can maintain their grip on the snow along their entire length. Thus, the ski never loses contact with the ground. The light weight of the carbon also plays a critical role for skiing curves. The weight per ski is a mere 960 grams.